Cloud: When running process/orchestration engines in the cloud you might not be able to reach the target service via network connections – and VPNs or Tunneling is always cumbersome. It is much easier if systems collect their work items by pullig it from the process engine. Polyglott Programming: When using different programming languages it gets harder to have proper service interfaces available to call. Even if REST is present in almost every programming language – provide an active REST Server is not always easy. However, calling an URL is not such a big deal. Microservice architectures (see my blog post about BPM and Microservices): This basically intensifies the two trends above. 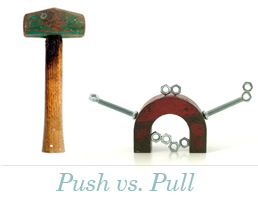 The basic idea is simple: Instead of actively calling a service (PUSH) we let the service ask for work (PULL). Of course you can mix both styles within one process whenever appropriate! 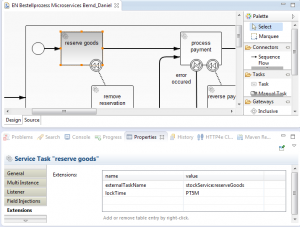 To implement the Extern Task Pattern on a existing camunda BPM Platform the easiest possibility is to leverage User Task behavior. Then you will create Tasks in our Task Management, but assign them to external systems (I tend to call them “worker”) instead of humans. The idea is exactly the same – you have one or more workers doing one job – and they get tasks from the task list, claim them when they start working on it and let the engine know when they are finished. You can easily scale by adding more workers. Exactly the same as with Human Task Management. For Business-IT-Alignment reasons we want to keep a ServiceTask in the BPMN process (read: The automation icon – not the human icon). Fortunately it is pretty easy to exchange behavior for specific tasks in the camunda engine. You can find a fully working prototype with detailed technical descriptions here: https://github.com/camunda/camunda-consulting/tree/master/snippets/external-task. Use a lock time for workers and release locks automatically afterwards, to avoid stuck processes when a worker crashes. 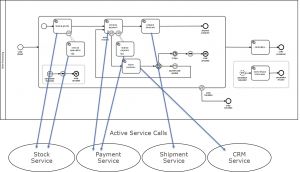 Think more about transactions and rolling back a service task in this scenario. Process Engine does not need network connection to worker. 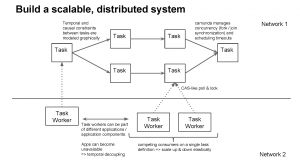 Availability of Process Engine and Worker is decoupled (temporal) – if a Worker is not available the engine just waits until a service task is finished somewhere in future. Scalability: You can easily add new workers which execute jobs. Technologic independence: The worker can be written in any technology you like as long as they can ask for jobs at the process engine (typically via http -> REST). We did discuss this already in the past and Daniel provided some pseudo-code how the External Task could be supported by core engine features. He could also think of a Java API where you do not really recognize that you are building an External Task Worker. 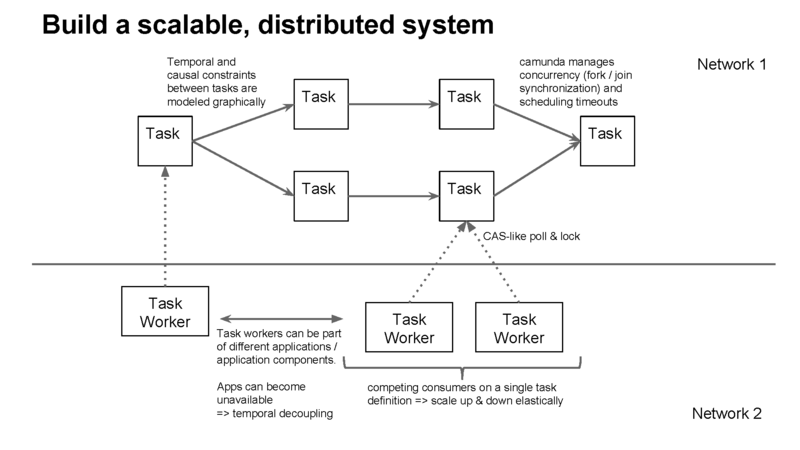 It would be as easy as implementing “normal” Service Tasks in camunda. Daniel was even half through with a protoypical implementation in the engine – which proofed that it works. See https://github.com/camunda/camunda-bpm-platform/commit/39a74c2a2c8966f22cbaa5e7e910941c45b46a25 if you are interessted in details. Awesome – or what do you think? greate feature , best fit for microservices! for me this sounds like a very important feature. Also the described approach sounds very feasible for me. But I think, the reason why people use CamundaBPM and in general middleware stuff, is to focus on business logic and not on infrastructure coding. This means, until this faeture is part of the CamundaBPM core solution, all will use a classic approach with an ESB (BPMN engine calls ESB, ESB takes care about the messaging).